Imagine you can hear Abraham Lincoln speaking the words from his famous Second Inaugural Address: “With malice toward none; with charity for all.” What voice did you supply for Lincoln? Was it a resonant baritone, or a high-pitched tenor? 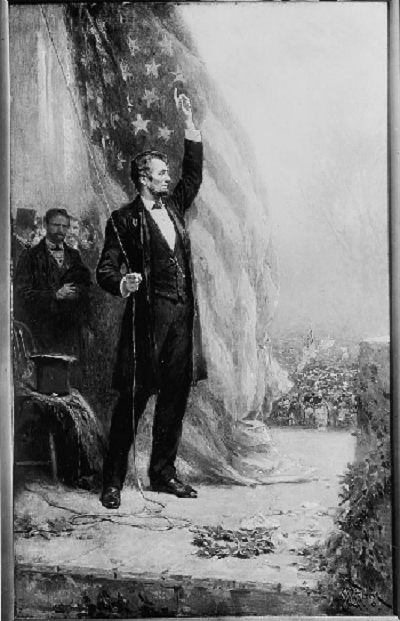 Artist Jean Louis Gerome Ferris’s interpretation of Abraham Lincoln speaking at a flag-raising ceremony. While many people expect that Lincoln must have had a deep, stentorian tone, Lincoln’s true voice was high pitched and reedy. It was this voice that Daniel Day-Lewis used to portray Abraham Lincoln in the 2012 film “Lincoln,” and which provides a close approximation of the real Abraham Lincoln’s voice. A number of Lincoln’s contemporaries left accounts of his voice and speaking style. 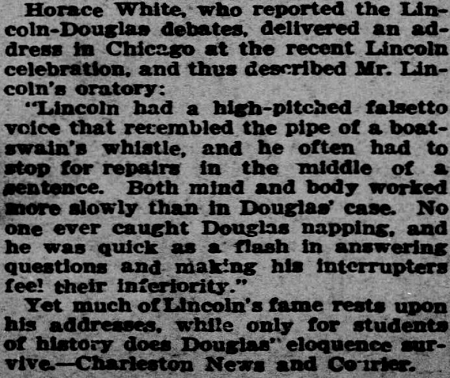 Journalist Horace White described Lincoln as having “a thin tenor, or rather falsetto, voice, almost as high-pitched as a boatswain’s whistle.” Others described it as “shrill” and “sharp,” which the New York Herald noted in February 1860 had “a frequent tendency to dwindle into a shrill and unpleasant sound.” For most listeners, however, the power of Lincoln’s words soon outweighed any discordant note in his delivery. 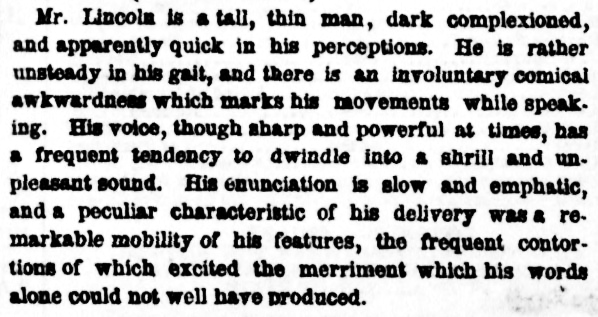 Excerpt from “The Presidential Campaign,” published on Feb. 28, 1860, in the New York Herald. Despite its high pitch, Lincoln’s voice carried, an important quality for speakers at large gatherings in the preamplification age. Observers noted that Lincoln’s voice had “much carrying power, that could be heard a long distance in spite of the bustle and tumult of a crowd.” The “rich baritone” of Lincoln’s rival Stephen A. Douglas may have been more pleasing to listeners during the 1858 Lincoln-Douglas Debates, but Lincoln’s tenor “had better wearing qualities” and could be heard by those at the far edge of the crowd. A section from “Words of Southern Indiana Dialect” provided by Charles Remy to Sen. Albert Beveridge in October 1924. 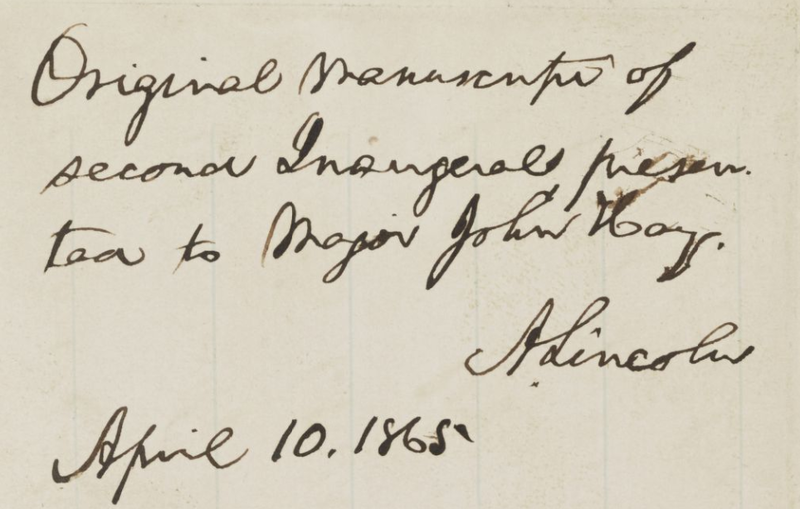 Lincoln’s misspellings in handwritten documents also suggest his phonetic pronunciations of some words. Interestingly, Lincoln frequently misspelled “inaugural” as “inaugeral.” He even misspelled the word in his inscription to his secretary John Hay, to whom Lincoln presented the handwritten manuscript copy of his Second Inaugural Address. In addition to clues to Lincoln’s voice suggested by regional dialects and recorded by contemporary accounts, Abraham Lincoln himself provided actors in the future with a valuable gift for recreating his famous Second Inaugural Address. Lincoln physically cut and pasted the printed proof of his address into a script that served as his reading copy on March 4, 1865. And thanks to contemporary observers and Daniel Day-Lewis’s performance in “Lincoln,” we have a better appreciation of what Abraham Lincoln sounded like when the war came. Michelle Krowl is a historian in the Library of Congress Manuscript Division.